Hey all, just a quick note…the show was great. Kyler is a true performer and professional. Even though the attendance was abysmal, she was a trouper and put on a great show. In fact, when I told her our numbers, her response was, “You know if I’m playing for 100 people great! If I am playing for 3, that’s great too. At least I get to spend the evening playing my songs for people. It’s like pizza. How bad can it be? 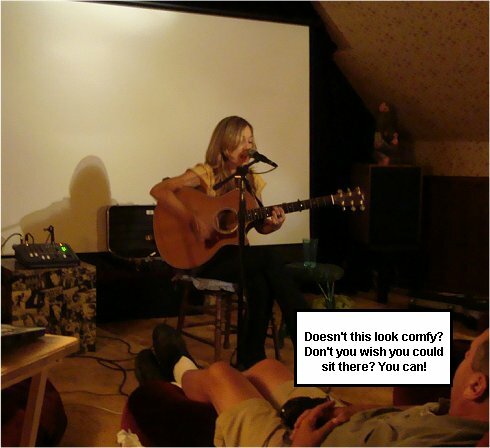 ” Now that’s the right attitude for house concerts!!! She is exceptionally talented and deserved to have a full house of people, but I guess we can’t compete with other events happening (vacations, family visits and work were the top reasons for either not signing up or for canceling last moment). I only have a moment and I forgot the camera cord at home, so I can’t post any photos yet, but I wanted to tell you it went well and we had fun! After the show (which we held in the theater again) we put on the Olympics just in time to see Michael Phelps win his 8th Gold and we all hooted and hollered. It was cool to see it on the big screen too! ← Parlor Party: Kyler England TONIGHT! !